APEC is a forum for economic cooperation of all countries bordering the Pacific. It was set up in 1989 in response to the economic rise of Asian countries. APEC's 21 members include the United States, Russia, China and several countries in South America and Asia. This is a collection of DW's latest content on APEC. It is the first time that world leaders meeting at the APEC summit have been unable to sign a final joint communique. The gathering in Papua New Guinea was dominated by diplomatic sparring between the US and China. President Xi Jinping will showcase China's Belt and Road initiative (BRI) to Pacific leaders at 26th Asia-Pacific Economic Cooperation (APEC) Economic Leaders' Meeting in Port Moresby, the capital of Papua New Guinea (PNG). China has been developing a cooperative strategy to gain influence in developing countries in Oceania through infrastructure projects. The Asia-Pacific Economic Cooperation (APEC) summit has been taking place annually for nearly three decades. During the summit, the 21 leaders take a "family photo" wearing traditional clothes of the host country. US President Donald Trump and his Philippine counterpart Rodrigo Duterte are renowned for their unpredictable nature and coarse rhetoric. Their meeting comes accompanied by a wave of protests. Ana P. Santos reports. Donald Trump's "America First" mantra won him the presidential election, but it may have cost the US its place as world superpower. China is hot on America's heels economically and politically, writes DW'S Miodrag Soric. In a joint statement on Syria, the US president and his Russian counterpart have agreed to fight "IS" extremists together. At a regional summit, the leaders also denied claims of Moscow interference in the US election. 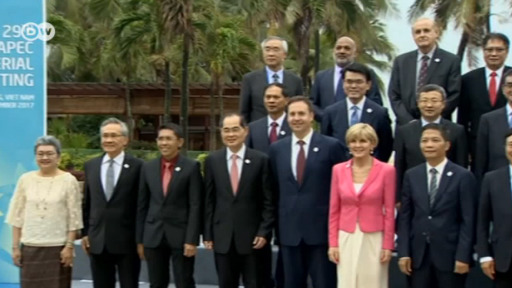 The 29th annual meeting of the APEC Pacific Rim states has got underway in Vietnam. Key topics include the US government's current protectionism stance under Donald Trump. The US president has told CEOs at the APEC summit that the US has suffered under past trade deals, and would now take a different path. Meanwhile, a talked about meeting with the Russian president did not materialize. US-Russian relations have become noticeably worse since both countries' leaders met in Hamburg in July. So, will they meet at the APEC summit? Conflicting answers have emerged. Vietnam is hosting this year's Asia Pacific Economic Cooperation (APEC) summit, which gives it an opportunity to tout the benefits of global free trade. But convincing protectionists like Trump remains an uphill task. 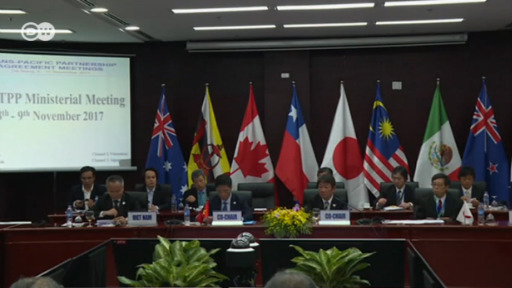 The remaining members of the Trans-Pacific Partnership are trying to reach agreement on a new deal that would enable them to move forward without U.S. participation at the APEC meeting of foreign and trade ministers in Vietnam.